Too bad. In 2016, the TV industry is not yet sufficiently rattled by the rise of streaming video to produce the a la carte video plans people really desire. For now, we’re getting a proliferation of so-called “skinny bundles,” smaller TV plans that occupy a middle ground between choosing the exact channels you want and paying for hundreds of channels you don’t. If you're looking for an instant recommendation, Sony's PlaySation Vue is the better of the two services. But that doesn't mean it's the right choice for every cord cutter. Read on to understand why. 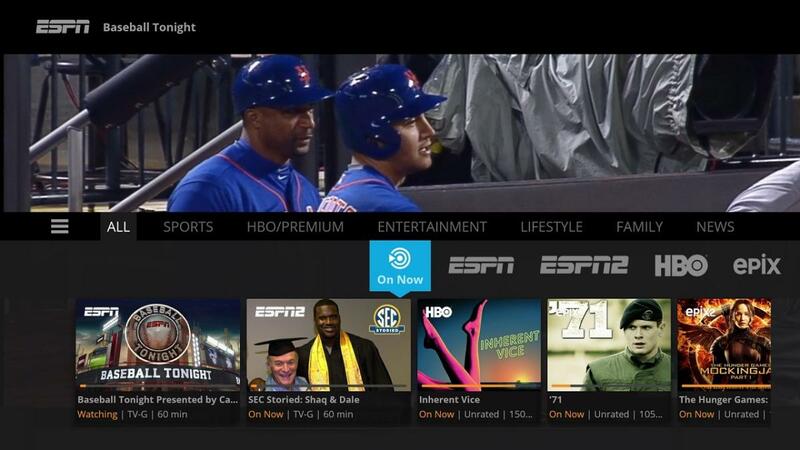 Sling TV launched in early 2015. Pricing starts at $20 or $25 per month, depending on which package you get. The Sling Orange plan, which lets you watch on one device at a time, has 28 channels, including ESPN, CNN, TNT, and AMC. Sling also sells $5-per-month add-on channel packs revolving around themes such as Kids, Sports, World News, and Lifestyle, plus with a trio of Spanish-language add-ons. 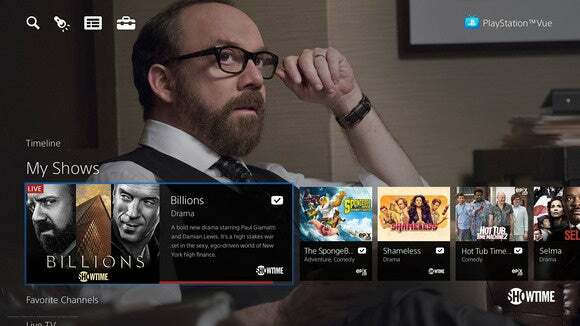 Add-ons for HBO, Cinemax, and Starz are also available for $15 per month, $10 per month, and $9 per month, respectively..
Sling also offers a separate Sling Blue bundle for $25 per month, that lets you watch on up to three devices at the same time. It has more channels—48 in total—including Fox, FX, and regional Fox Sports networks. This plan doesn’t include ESPN or Disney channels, and it doesn’t allow Kids add-ons. Also, its sports add-on costs $10 per month, but includes NFL Redzone. In any case, Vue subscribers can tack on roughly 10 more channels—including regional sports networks such as Fox Sports—for another $5 per month, or add 40 channels for $15 per month. Showtime is also available as an $11 per month add-on (an option you can’t get on Sling TV), along with HBO and Cinemax (both $15 per month). This table gives a glance at each service's features (click to enlarge). 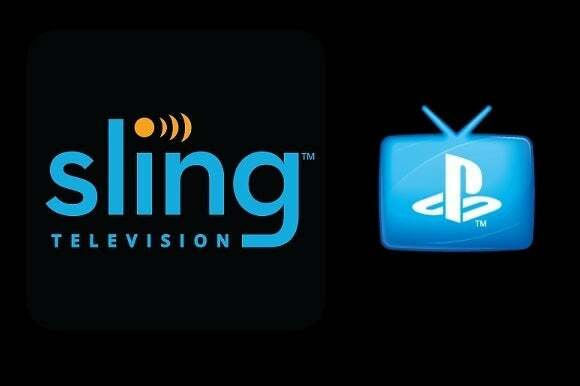 Like most streaming services, Sling TV and PlayStation Vue come with viewing restrictions. With Sling TV, you’re limited to viewing on one device at a time if you choose the single-stream package with ESPN and Disney channels, making it a non-starter for some families. The multi-stream package allows viewing on three devices at a time, but local feeds of Fox are only available in a handful of markets (Atlanta, Austin, Charlotte, Chicago, Dallas, Detroit, Gainesville, Houston, Los Angeles, Minneapolis, New York, Orlando, Philadelphia, Phoenix, San Francisco, Tampa, and Washington D.C.). Those feeds won’t be available if you travel outside those cities. PlayStation Vue’s restrictions are even thornier. 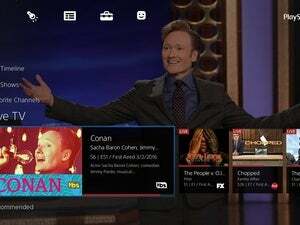 Although the service allows five streams at a time, only one PlayStation 4 or one PlayStation 3 can be streaming at the same time. All TV devices (such as PlayStation consoles, Fire TVs, and Chromecasts) must also be under the same roof. If Sony detects an anomaly in IP addresses, you could get blocked from the service. Mobile viewing is also restricted, with certain channels unavailable on Vue’s iOS app in your own house; even more get blocked when you're on the go. One area where Vue excels is support for TV Everywhere apps such as WatchESPN, Comedy Central, and FXNow. Sony’s service lets you authenticate with 60 of these apps, even on platforms where there is no Vue app available. Sling TV provides authentication only to WatchESPN, making it feel less like a bona fide pay-TV package. On the other hand, a cable-TV subscription can get pretty expensive once you start renting DVRs for multiple TVs, and those promotional bundle deals tend to disintegrate after a couple years. Part of the allure with streaming services such as Sling TV and PlayStation Vue is their freedom from hardware rental fees, hidden costs, and complex cancellation procedures. As for which service is better, that distinction goes to PlayStation Vue. It offers more channels for the money, better personalization, easier access to your favorite shows, and higher-quality video for sports. Sling TV is only worth considering if you really want to limit your spending, or don’t own a device that Vue supports. In a way, this is the cord-cutting trade-off encapsulated: The more money you want to save, the less cable-like your experience becomes. 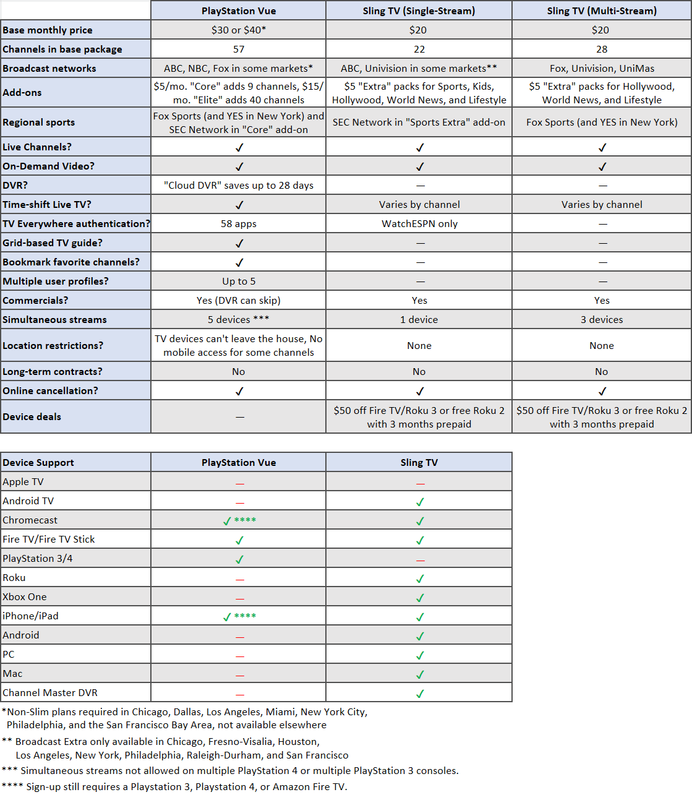 This table lists all the channels available on each service (click to enlarge).